MAC Dima’s Glow Extra Dimension Skinfinish ($36.00 / £25.50 for 8g / 0.28 oz) is a light gold with warm undertones and gold sparkle finish. 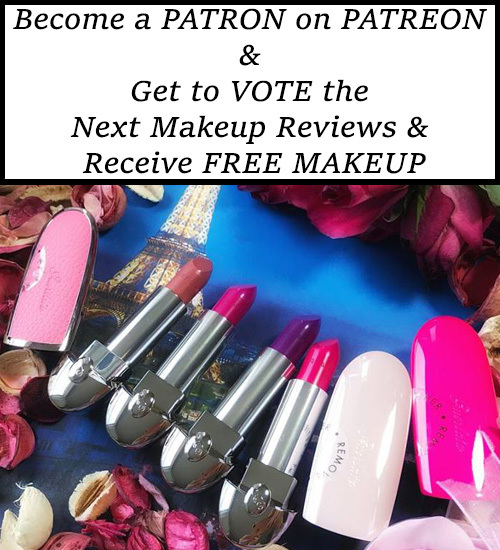 It has a great color payoff being quite pigmented even on bare skin. The color has a golden, radiant glow with a velvety soft texture that is finely pressed into the pan. It applies well and blends easily but it gives some minor fall out during the application. I noticed how the shimmer migrated a bit on my cheeks throughout the wear so I prefer to apply less product and get a radiant, luminous finish that having an intense pop of color. 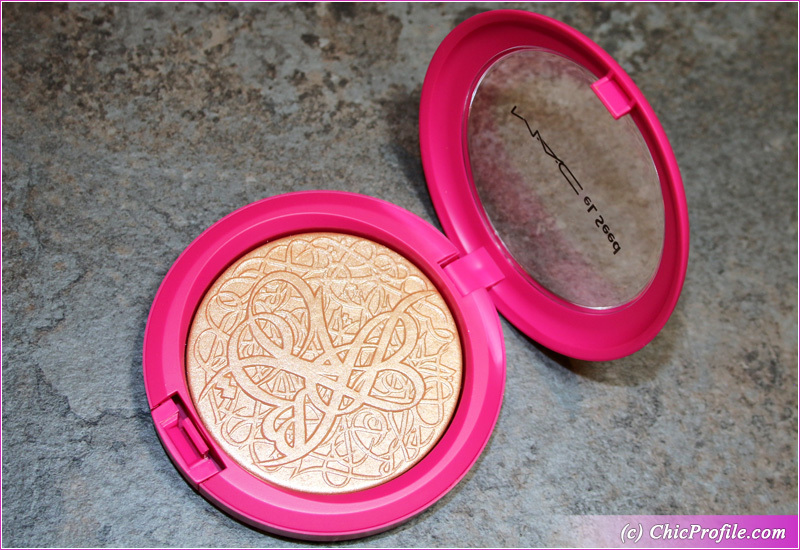 MAC Dima’s Glow Extra Dimension Skinfinish can be a perfect highlighter for those who like golden shimmery highlighters with an intense color payoff. 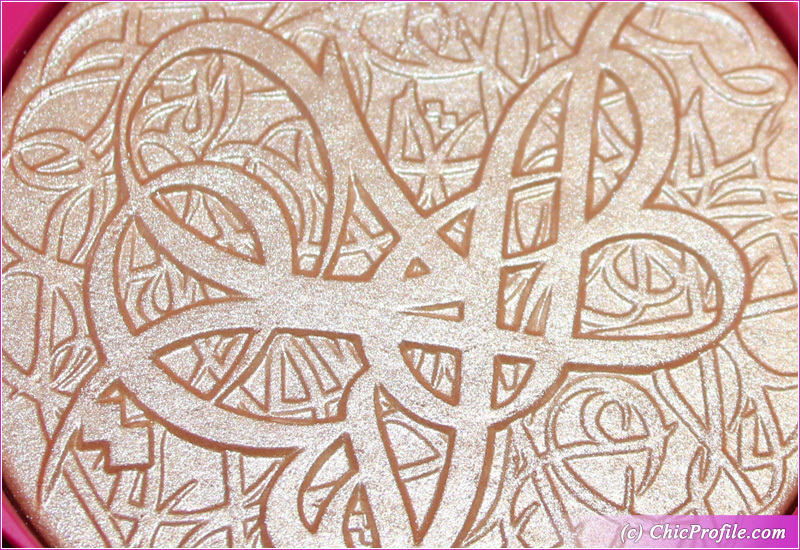 It almost pains me to use Dima’s Glow Extra Dimension Skinfinish and swirl my brush into its beautiful El Seed calligraphic pattern. 🙂 I prefer to use a slightly damp brush or just spritz my fluffy brush with MAC Fix+ a couple of times. I find that the shimmer is less prone to migrate on my cheeks if I’ll apply the product this way. 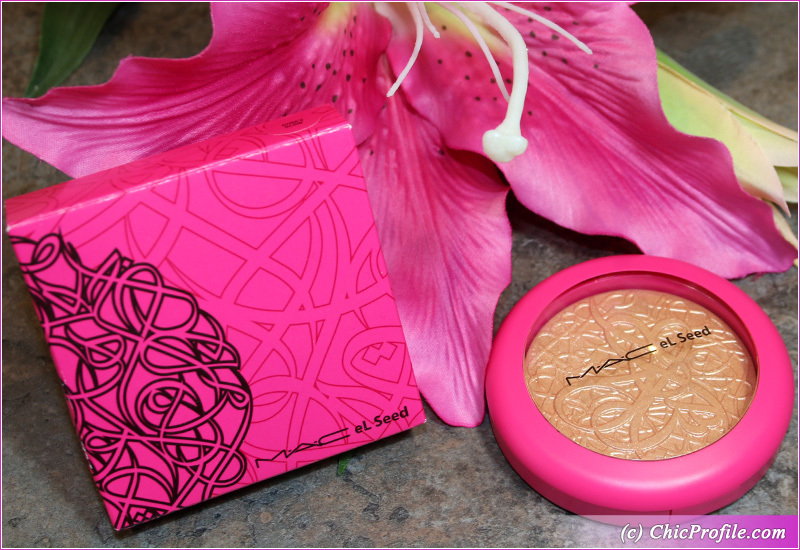 As much as I like the pink packaging and its bright color I must say this combination gives the product a cheap look. I would have chosen another type of packaging that would have truly emphasized this luxurious Skinfinish highlighter. The thing with MAC Skinfinish products is that they can be used not only as highlighters and you can customize the opacity going from soft to intense just by adding a few layers. 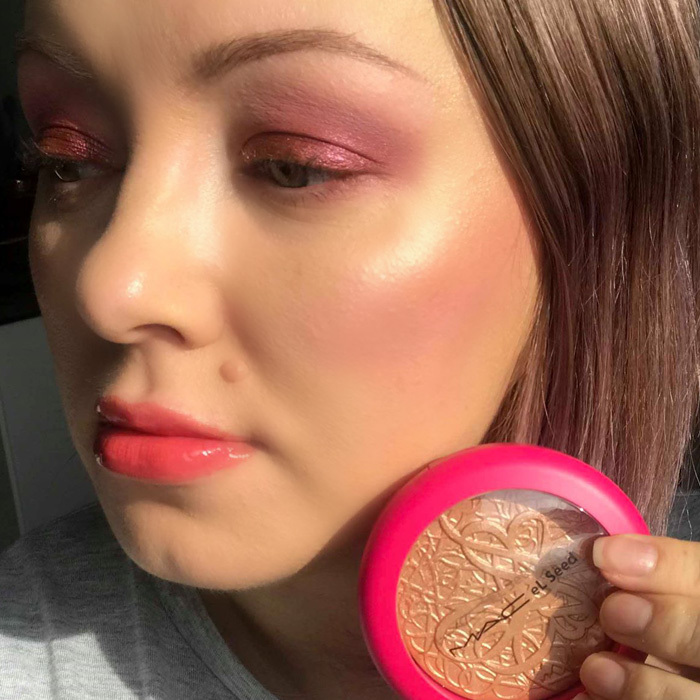 You can use MAC Dima’s Glow Extra Dimension Skinfinish on the bridge of your nose, on the browbones to add luminosity or even across your face. I wouldn’t say it emphasized my skin texture but having a combination skin type makes me be more careful on how I apply and wear a shimmery product. With this formula I got around 8 hours wear with some minor fall out on my cheeks. 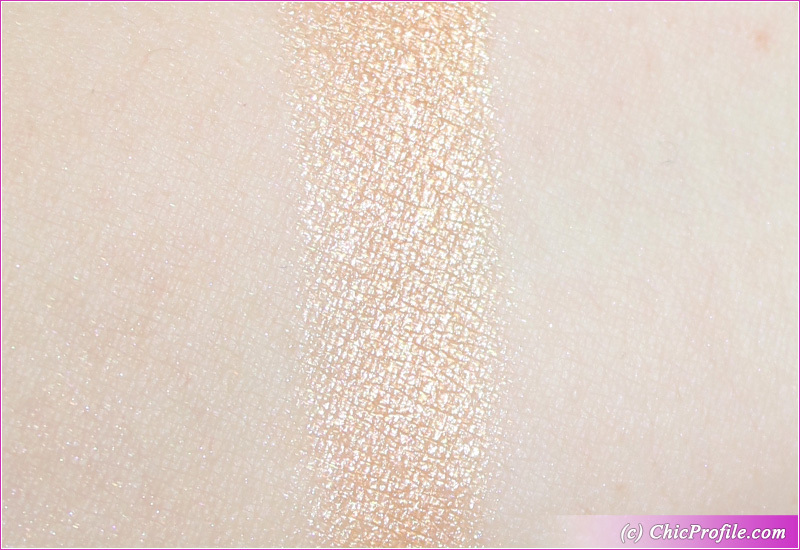 Here’s a swatch of MAC Dima’s Glow Extra Dimension Skinfinish on my bare skin. I applied the product dry and in a single layer / swipe. 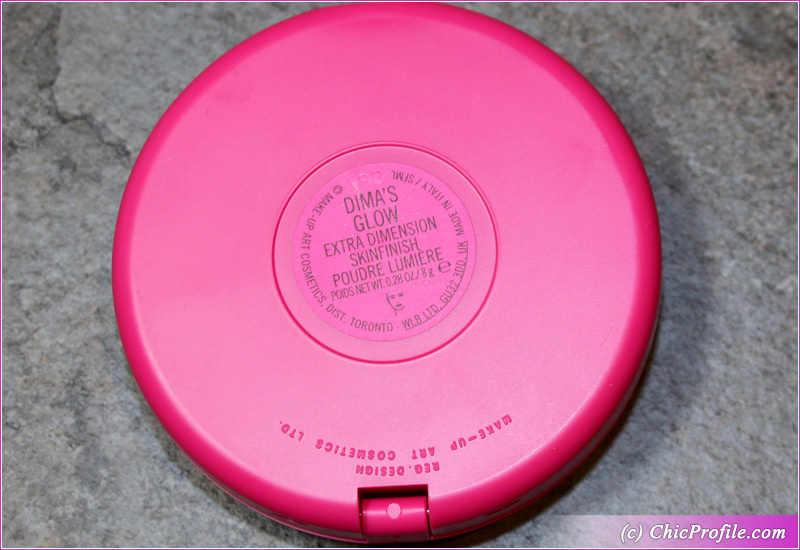 Here’s one of my favorite MAC Dima’s Glow Extra Dimension Skinfinish makeup looks where I choose to wear this product in a softer version. I applied only a single layer of MAC Dima’s Glow on top of my cheeks for a soft, radiance glow and blended gently towards my temples. 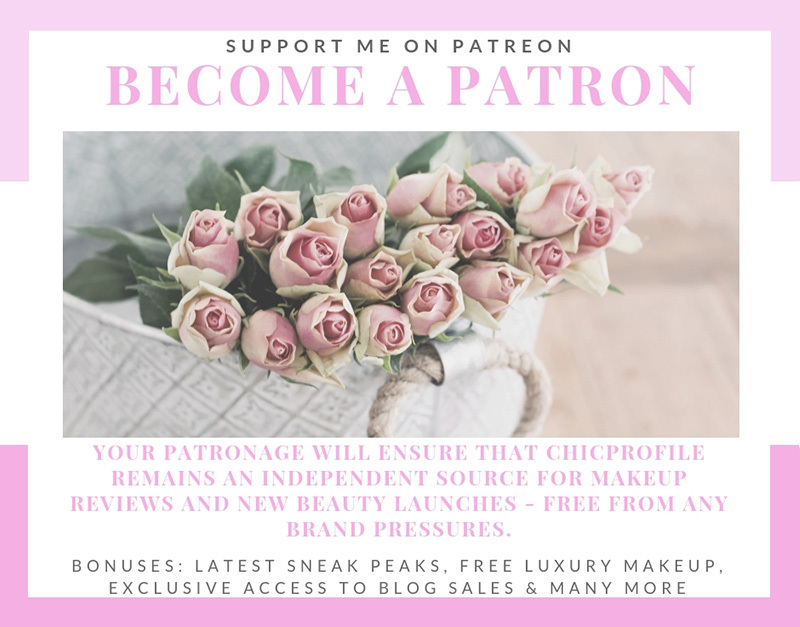 On my eyes I’m wearing the shades from MAC Kabuki Doll Eyeshadow Palette (review, swatches) from MAC Boom, Boom, Bloom Spring 2019 Collection which is still available online.